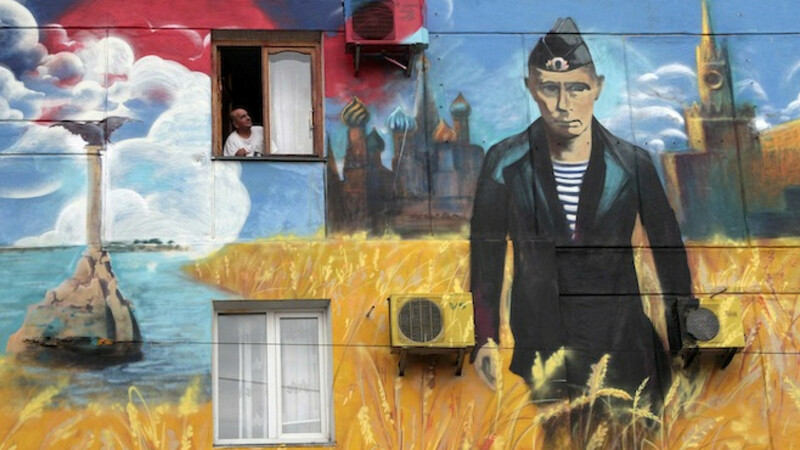 A man looks out of his window surrounded by a recently created piece of graffiti depicting the Kremlin, Russia's President Vladimir Putin and the Russian flag, on the wall of a residential building in the Crimean port of Sevastopol. A new survey ranking countries' in terms of their contribution to humanity has placed Russia in 95th place — only one place above the Democratic Republic of Congo. The Good Country Index, conceived by independent policy advisor Simon Anholt, measured 125 countries' contribution to human wellbeing using data from the World Bank, the United Nations and several other international organizations and NGOs to show whether a country is " a net creditor to mankind, a burden on the planet, or something in between." Ireland topped the ranking in first place, scoring well in the seven separate categories that included "health and well-being," "prosperity and equality" and "planet and climate change." Finland and Sweden finished in second and third, respectively, with the Netherlands and New Zealand completing the top five. Closer to being a burden rather than a net creditor according to the ranking, Russia came in 95th place, sandwiched in between Congo and Honduras, after scoring particularly poorly in the "prosperity and equality" category. The U.S. did not even make the top 20 — ranking in 21st place overall due largely to its weak showing in the "peace and security" category, where it ranked 114th. Libya ended up at the very bottom of the list, with low scores all round. Anholt, an honorary professor in political science at Britain's University of East Anglia, said in comments published online that the rankings were not intended to "start a global discussion about how countries can balance their duty to their own citizens with their responsibility to the wider world." "It's time countries started thinking much harder about the international consequences of their actions; if they don't, the global challenges like climate change, poverty, economic crises, terrorism, drugs and pandemics will only get worse," Anholt added in comments published by Britain's The Independent.